The process of getting straighter teeth has become more esthetically pleasing since the introduction of invisible braces. These braces are more appealing in appearance and allow patients to spend less time in the dentist’s chair than traditional braces. However, invisible braces may not be for everybody since there are advantages and disadvantages to wearing them. You must first determine if you are willing to take on the responsibility of wearing them before making any final decisions. Determining whether invisible braces are a better option for you over traditional braces requires a clear understanding of the responsibilities for both types of treatments. A patient who doesn’t mind allowing the dentist to make forceful monthly adjustments to his or her teeth is suited for traditional braces. On the contrary, those who desire the benefits of a clear aligner must understand that the biggest responsibility falls on them. Although you will periodically visit the dentist for assessments, you will be responsible for switching out your aligner every few weeks with a new aligner. 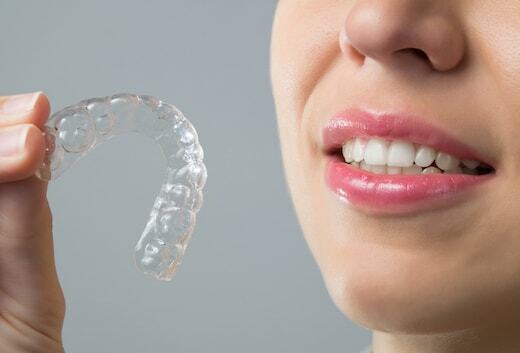 The aligners will be in a numbered package and each provides a subtle shift of your teeth. In addition, the aligners need to be worn consistently for 22-23 hours per day. Patient must only remove the invisible braces when consuming any food and while brushing their teeth. The requirement of removing the aligners before eating anything can be an advantage but it can also be a disadvantage if you are in a public environment for a meal. Furthermore, you must be diligent with brushing and flossing after each meal before replacing your aligner tray. For these reasons, you must take some responsibility in order to benefit from invisible braces. Like the name says, invisible braces are virtually invisible. Many adults and teens want straighter teeth but do not like the idea of everyone knowing they have braces. Invisible braces can correct crooked teeth without compromising your confidence or smile. Invisible braces can correct a variety of dental issues including crowded teeth, spacing, overbites, underbites and cross bites. Another advantage of invisible braces is the opportunity to see the gradual progression of the teeth shifting into place. As patients see the benefits of the aligner trays, they are more likely to follow the treatment. Since the aligner trays are removed prior to eating, you are not limited in the types of food you can consume. With traditional braces, there are certain foods you can and cannot eat while wearing them. Some food items can become entangled in the brackets and make them difficult to clean. Food can become trapped in the metal wires and the wearer may not even realize it until much later. Since invisible braces are removable, brushing and flossing is easier than with traditional braces. Unlike traditional braces, invisible braces are made of a smooth plastic material. There are no metal protrusions which can puncture or scratch the inside of the mouth. Traditional braces can take 3-5 years to provide the expected results but invisible braces only take about 1 to 1 ½ years to straighten the teeth. Since the treatment plan is fully computerized, patients know ahead of time what they can expect and approximately how long it will take. Invisible braces are limited in what they can accomplish. They are best suited to treat malocclusions that are considered mild to moderate. Teeth that are severely rotated by more than 20 degrees, or tipped or angled more than 45 degrees, means patients have large tooth spaces or severe overbites. They may not gain adequate results with the aligners and traditional braces may be a better option for them. Patients with crowns or porcelain veneers may be limited from having invisible braces which require “buttons” or “attachments” since it can be problematic to bond these formations onto some types of dental work. Since the plastic aligners should fit tightly to the shape of the teeth to allow enough force to shift them, the shape of the teeth may limit what the braces can accomplish. Teeth that are short, pegged, round or severely tipped may not be properly manipulated by invisible braces. All teeth restorations should be completed prior to treatments with invisible braces since even one dental treatment to alter the shape of the tooth can interfere with the fitting of the aligners. However, small corrections which do not influence the shape of the tooth might be okay for invisible braces. Patients with dental bridges may not be able to use invisible braces since they are used to bridge a gap between missing teeth and could become damaged.